April is designated as Men’s Health Protection Month in Armenia, during which men will be encouraged to have prostate gland examinations. 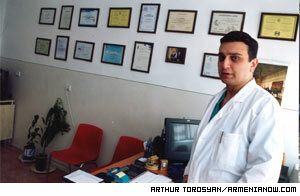 Free sonogram examinations will be offered at the Armenia Medical Center in Yerevan. 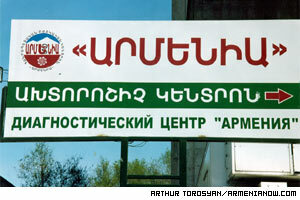 It is the first time such examinations have been given free in Armenia. “We want to pay much more attention to men’s health and render quality medical treatment to them,” says director of Urology at the Center, Armen Muradyan. Muradyan says that while more attention has always been paid to women’s health, there are no centers designated to men’s health care. Muradyan says there are numerous private and public organizations which developed programs for early detection. But those services do not function as effectively as possible, due to a lack of money. The Urology Center and Diagnostic Department of Armenia (at Republican Hospital) and Urology Department of the Yerevan State University have initiated the April campaign. Mainly 40-45 year old men will be served in the center. And, also in a new measure for Armenia, their results will be recorded on a CD file. “Of course, it would be good if all our citizens had such e-passports with the information starting from the moment of mother's pregnancy,” Muradyan says, adding that the system is a first-step toward creating a “Health Bank”. Ordinarily, prostate gland screening costs 10,000 drams (about $18). Until the end of the month, however, they will be free. After examinations, high-risk patients will be included on special lists for further treatment. The specialist says that with age-specific disease such as prostate cancer, a man may not feel any discomfort until it is already too late to cure. “One of the goals of the program is to allow people to undergo examinations when they have no complaints yet,” explains Muradyan. Muradyan says the program’s success will rely heavily on women encouraging their men to participate.